Margarita Figari de Faget, Montevideo. Anon. sale, Christie's, New York, 23 - 24 November 1993, lot 98 (illustrated in color). We are grateful to Mr. Fernando Saavedra Faget for his assistance in confirming the authenticity of this work. Pedro Figari (1861-1938 ) used to say that he was not a painter but that he merely documented the past so that future generations would have his testimony. This became an obsession--in his studies, teachings, writing and most importantly in his paintings. He would take his students to the famous Museo de la Plata to see the pre-Columbian collections--part of a cultural history--which he referred to in his teachings and employed in some of his paintings. Figari's interest in pre-history is also depicted in themes related to momentous events such as the discovery of fire and the invention of the wheel. His imagination allowed him to illustrate several historical landmarks based purely on his personal ideas; he understood his country first-hand as well as its historical and political upheavals under which the course of history unfolded. He witnessed and participated in contemporary struggles both in Argentina and Uruguay. In his work, Figari often depicted the everyday life of the black communities near the city of Montevideo which he had frequented in his youth. These communities, once freed from slavery, had remained close and united. Figari portrayed colonial and post-colonial life in many of his compositions such as this painting. His experiences as a youth marked him forever and the past seemed to be a source of inspiration for his work. These visual relics of youthful days, in fact, were present for him in the architecture and interior decorations of the places he knew well. This author, living three generations later, is also familiar with such past memories; I too, have visited great aunts who had similar-looking drawing rooms as in the artist's oeuvre and felt the past present. The artist's countryside scenes are subtly still and his long-drawn vistas are intimate. Figari's portrayals of South American black celebrations as well as his images of gaucho dances, reveal great movement and dynamism. But in other images of ceremonious drawing rooms, such as this one, the artist emphasized formal qualities and a certain severity. It is in theses images where the artist's inventive symmetry used to depict ambience, is noted. In his compositions, symmetry creates and indeed sets the stage for the development of narratives. Figari's drawing rooms, parlors, ballrooms and sitting rooms are backdrops and seem like theatrical scenes where life is played out by the characters illustrated. Symmetry or its absence, are never accidental for Figari. The artist deploys his figures like lines and angles that exhibit a truly modernist aesthetic. Figari's palette had few constraints; his use of colors for dramatic effects or quiet stillness, are evident in the many portrayals of drawing rooms and various interiors. His use of red to highlight brown or other bright colors against rich dark tones demonstrates his sophisticated understanding of color and affirm his avant garde influences. 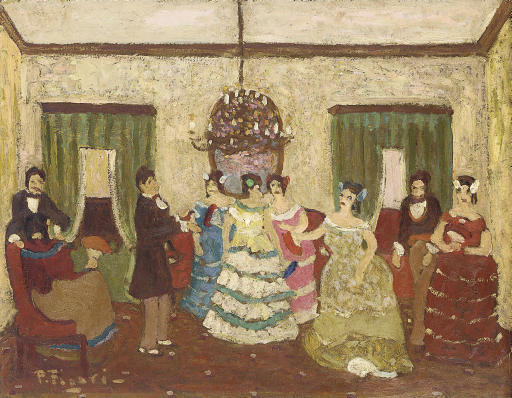 Although Pedro Figari produced paintings and drawings throughout his life as an amateur artist, at the age of 60 sometime around 1919, and up to 1933, he devoted himself almost exclusively to painting--first in Buenos Aires in 1921 and subsequently in Paris in 1925. This painting most probably dates to his last years in Buenos Aires or his first years in Paris.